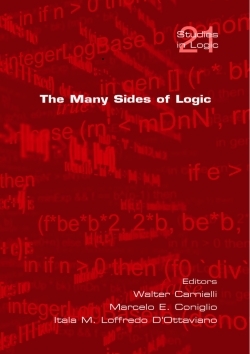 The ``Many Sides of Logic'' is a volume containing a selection of the papers delivered at three simultaneous events held between 11-17 May 2008 in Paraty, RJ, Brazil, continuing a tradition of three decades of Brazilian and Latin-American meetings and celebrating the 30th anniversary of an institution congenital with the mature interest for logic, epistemology and history of sciences in Brazil: CLE 30 � 30th Anniversary of the Centre for Logic, Epistemology and the History of Science at the State University of Campinas (UNICAMP) XV EBL -15th Brazilian Logic Conference XIV SLALM � 14th Latin-American Symposium on Mathematical Logic Several renowned logicians, philosophers and mathematicians gathered in colonial Paraty, a historic village on the Brazilian coast founded in the 17th Century and surrounded by the luscious Atlantic rain forest to deliver lectures and talks celebrating the many sides of logic: the philosophical, the mathematical, the computational, the historical, and the multiple facets therein. The topics of the joint conferences, well represented here, included philosophical and mathematical Logic and applications with emphasis on model theory and proof theory, set theory, non-classical logics and applications, history and philosophy of logic, philosophy of the formal sciences and issues on the foundations of mathematics. The events have been preceded by a Logic School planned for students and young researchers held at the UNICAMP campus in Campinas, SP.